Seth Godin signing copies of his new book, Linchpin. – I was getting letters from people that said, ” This is not right. My life is not right. I went to the right schools, lost my job, and have not been able to make the right change in the world.” This led me to thinking on how we got here. – I looked at various books such as: Life Inc. by Doug Rushkoff where he points out that money really changed everything, and The Gift by Louis Hyde. – There is also a book by Steve Pressfield The War of Art on how hard it is to write a book, screenplay, etc. – Are you a genius? A genius brings new thinking to an old problem and solves it. – The factory model takes resources, people, systems, and generates a product/profits at the other end. – Henry Ford created the factory system. The Ford System took a man and gave him machinery and a process to follow, and paid him $5 a day to work. The deal was: the faster the assembly line goes, you make more money. – Interchangeable people are very efficient – you act up, I will fire you. – You can order from a drive thru at McDonalds where the orders are taken from people at a call center in another state rather than the McDonalds employees at the location you are ordering. – Industrialists wanted to train the public to work in a factory and to buy things. – Weapons of Mass Instruction by John Taylor Gatto states that school is a total scam since Carnegie and others thought establishing a public education system would train people to buy things. – Art is the act of a human being who is working without a manual and is able to connect with another human being to make something happen. – Painting is different. Plenty of people who put paint on canvas, but are not artists. – You don’t want to engage in any activity where the best you can do is already known. – Factory has workers and owners, but now with a computer you become the owner and worker. – Means of production owned by the workers. But now with the internet, we are sharing the work together without permission, without an expensive system, without an office park. – Bob Marley did not fit the model of what the record companies wanted. – Jimmy Wales founded Wikipedia. Tens of thousands of people working for free contributing to Wikipedia eventually put Encyclopedia Britannica out of business. – Mechanical Turk was a machine that acted like a person. Jeff Bezos of Amazon.com built a system where lots of people did little jobs. Lots of people doing work for very small amounts such as transcribe five minutes of audio for 10 cents. Then other parts are done by other people, and then all the little jobs are pulled together and completed as a whole. – What are our kids spending time in school doing? We teach them to fit in, be compliant. – All the things we got graded on in school we do not do at work in our current job. – Just because the tide is out does not mean there is less water in the ocean. – Every successful organization has a linchpin. – A linchpin is an artist. – Warren Buffet is an artist because he gives a gift (that is essential to being an artist), the generous act of when you share it. – The idea of abundance is a privilege to share. It does not cost you anything. – Lizard brain served a purpose for man to survive. Faced with a hungry tiger the lizard brain enabled you to fight or run for your life. The lizard brain sabotages you. Steven Pressfield calls this the resistance. – Our job is doing art – you just do it. – Your shenpa is a reflex that forces you to answer every criticism with a defense and a criticism in return. Certain things activate the lizard brain. When shenpa kicks in, we stop being an artist. – Anxiety is different from fear. Anxiety is experiencing failure in advance. We are living with all the downsides of failure before it happens. – There is never enough assurance. – Fearless means overcoming the anxiety. – If you do work that matters, that is what makes change. – How do you structure the world around you, so that things get done? – I cannot give you a map, then I would be telling you what to do, and if I tell you what to do, it won’t work. – Shipping is a battle between your artistic element and your lizard brain. – As you get closer to shipping, more thrashing happens. The team starts to change things (spec changes, color, process, etc.) and this disrupts the shipping date. – Thrash early and you will not miss the ship date. The afternoon question and answer was a great learning experience. 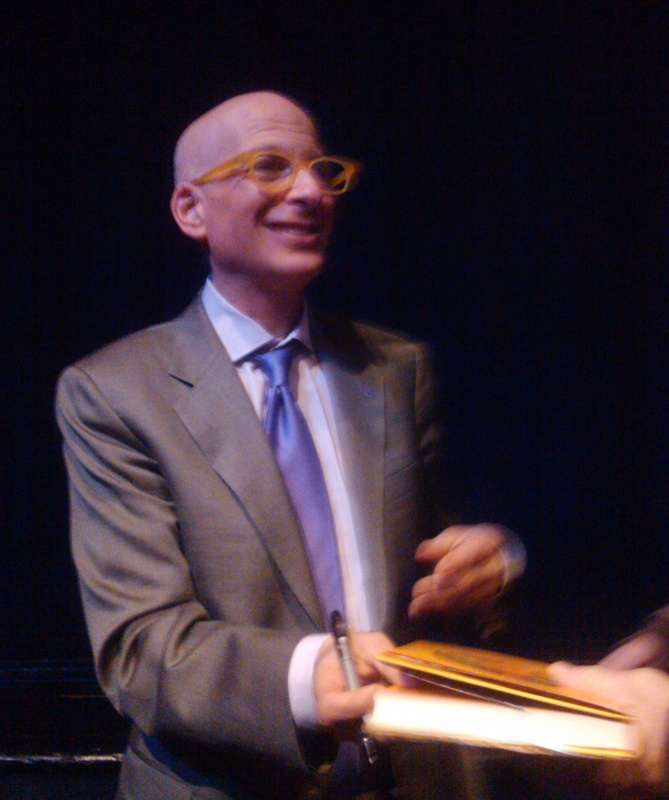 Visit the Seth Godin website for more information on his books and blog.